Tube complement: 1A7G mixer/oscillator, 1N5G IF, 1H5G detector, 1C5G audio output. There's no rectifier tube because this set plays only on battery power. Approximately 10-1/4 inches / 260 mm tall, without handle. This radio weighs 12 lbs. (5.4 kg) with battery, a lot to lug around. 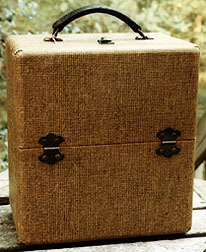 Its case is made of plywood, covered with "airplane cloth." Three other versions were available, with model number suffixes L, M, and Y instead of D. These others were covered with different colored cloth, or leather, and had a removable wavemagnet instead of the fixed loop antenna. This is the front of the radio with the lid closed, ready for travel. This is the back of the radio. Here's another back view with the radio opened up. That's the loop antenna on the left. 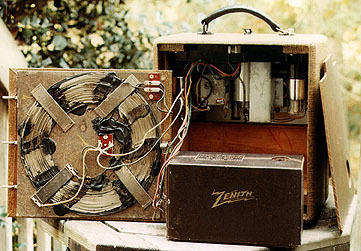 The brown rectangular object in front is the radio's special battery. The Bakelite chassis can be seen hanging upside down inside the case. 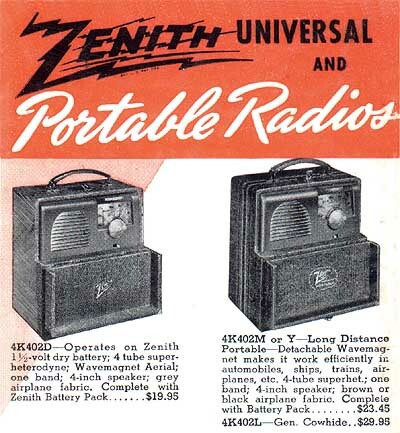 From the 1940 Zenith brochure. This radio caused me to come face to face with a dilemma faced by most collectors at one time or another. Physically, this radio is beautiful, showing little use, or at least no abuse, by its original owner. The chassis is pristine, and the case is pretty nice too. 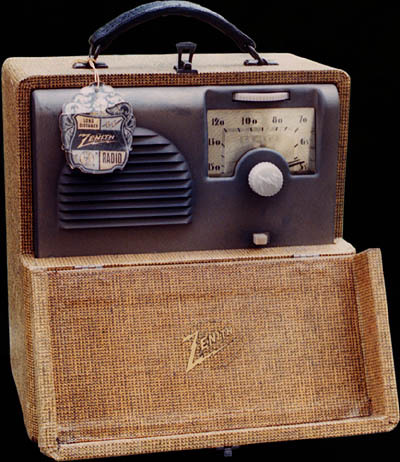 It's possible that the Zenith battery is the original battery, and the radio was used for just a few minutes or hours, then packed away, never to be used again. How sad. 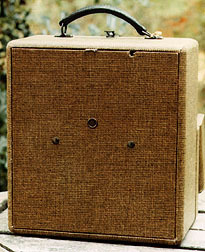 (1) The transformer is riveted to the speaker frame, and nestles beautifully into a notch in the molded Bakelite chassis. I didn't want to disturb the originality of this arrangement. (2) This radio operates on batteries only, and the original style of battery pack hasn't been available commercially for decades. Operating the radio would be difficult, requiring a kludged-together affair of modern batteries. So here we have a radio, one of only a few in my collection, that doesn't play. It sits in silent tribute to the designers and assembly-line workers who conceived and built it, one of the first practical portable radios made.